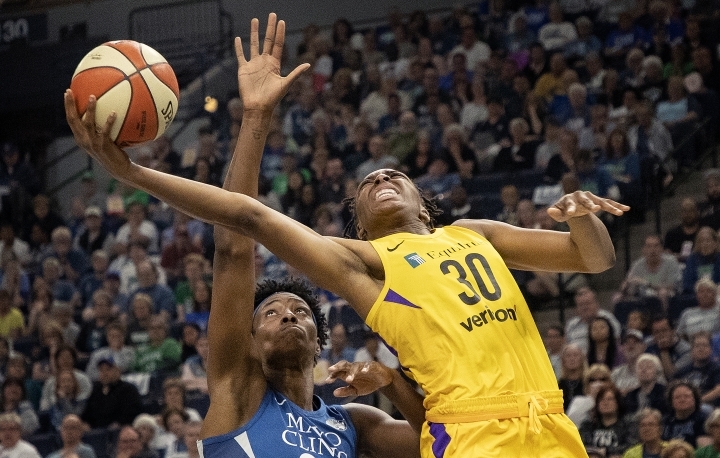 MINNEAPOLIS — There was no better way for the WNBA to open its 22nd season than with another intense matchup between the Los Angeles Sparks and the Minnesota Lynx. 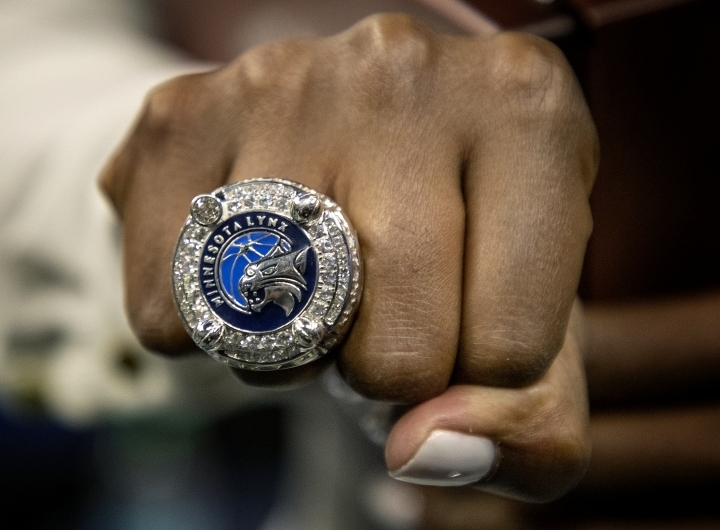 After the Lynx received their championship rings and raised a fourth banner in the arena, Chelsea Gray and the Sparks gave them their parting shot. Gray had 18 points, including a double-clutch off-balance in the lane at the buzzer that gave the short-handed Sparks a 77-76 victory over the Lynx on Sunday in a dramatic rematch of last year's finals. "Chelsea is the game-winner queen," said Odyssey Sims, who led the Sparks with 21 points. "I don't know how she squeezed up and flipped it in. I still don't believe. I don't even know how, but it was amazing." Lindsay Whalen had 10 of her 17 points in the fourth quarter, including a pair of free throws with 5.8 seconds left, to lead the Lynx back from a deficit that reached 10 points late in the third period. Gray then took the ball after a timeout at the left wing, used a spin dribble to evade Seimone Augustus and reached the paint in time for the final heave. "I'm very proud of this team right now," Gray said. "We kind of set the tone for the season." The Sparks-Lynx title pairing was made possible in 2016 when the WNBA switched to a conference-less postseason format, and the Sparks won on Minnesota's home court that year. Last fall, the Lynx avenged that crushing loss by beating Los Angeles at Williams Arena, where Whalen played her college games, while Target Center was being renovated. Over the previous two years, the Sparks and Lynx split their 16 matchups, with five wins apiece in the playoffs and three victories each in the regular season. This was the first time the Lynx lost a season opener since 2011, the year of their first title. They had won 23 straight regular-season games in May. 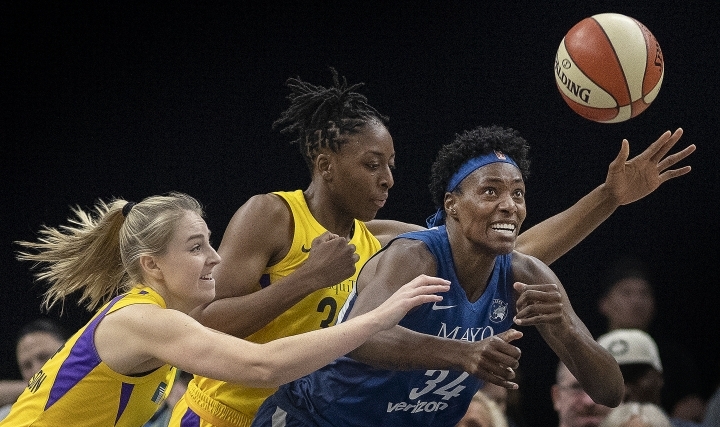 Nneka Ogwumike added 19 points and nine rebounds and Essence Carson had 10 points for the Sparks, who shot only 3 for 18 from 3-point range but still outscored the Lynx 25-11 in the third quarter. Whalen and 2017 league MVP Sylvia Fowles, who had 15 points and 12 rebounds, led the resurgence for the Lynx. They were riled up when Fowles was whistled for an offensive foul in the post, with an agitated Whalen giving official Tiffany Bird an earful. A few minutes later, after Fowles cut the lead to 59-53 with a layup, Sparks newcomer Cappie Pondexter got into a shouting match with Lynx coach Cheryl Reeve during the break in action. They were each given a technical foul, as were Whalen and Sims. Ogwumike knocked down a 3-pointer for a 71-68 lead with 3:08 remaining, and she turned a turnover by Rebekkah Brunson into a layup in transition and a five-point edge with 2:08 to play. The Lynx had a staggering 24 turnovers that turned into 23 points for the Sparks, more than in any game last season. Fowles hit two foul shots with 56 seconds left to bring the Lynx to 73-72, but Sims answered with a long jumper. Whalen came back with a pair of free throws, and Fowles grabbed the rebound of a missed 3 by Sims on the other end to set up two more foul shots for Whalen. That still left enough time for the Sparks to answer. "We just didn't come out ready to go, which is disappointing and what we'll have to clean up," said Whalen, the newly minted head coach at her alma mater, Minnesota, who has begun her 15th season in the league. Brunson pitched in 15 points, but Maya Moore had just 11 points on 4-for-14 shooting for the Lynx. Augustus had just six points. "We had so many players out there that had no idea what they were doing for whatever reason. Maybe they were tired. No idea," Reeve said. The Sparks couldn't have expected much more production without star Candace Parker, who didn't take the trip because of what was announced as a back injury. Russian center Maria Vadeeva, a key offseason acquisition, has not joined the team yet. Jantel Lavender, another important veteran, has not finished with her overseas club yet, either. "We love Candace. She's a heck of a player, one of the best in the league, but I just kind of focus on the people that are here," Sparks coach Brian Agler said. "That's all we do."